Shams 1 in Abu Dhabi ... the largest of its kind in the Middle East. The total investments by the Abu Dhabi government in the renewable energy sector has surged to Dh8 billion ($2.17 billion), thus reflecting positively on the sustainability of the industry for future generations, said a senior UAE government official. 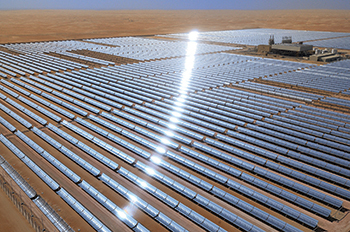 Abu Dhabi’s investments in the clean energy sector started in 2006 through Shams 1, the largest renewable energy project in operation in the Middle East at the cost of Dh2.2 billion with a capacity of 100 MW, remarked Awaidha Murshed Al Marar, the chairman of the Department of Energy. The solar field has 768 parabolic trough collectors to generate clean, renewable electricity, he noted. “The emirate’s investments in the clean energy sector will witness significant growth this year due to a number of new projects in the production of reverse osmosis water and solar electricity production,” stated Al Marar. Abu Dhabi, he stated, has built the world’s largest independent solar power plant, Noor Abu Dhabi, in Sweihan with a 1.17-GW capacity at a cost of Dh3.2 billion. Part of the production of the Noor Abu Dhabi power station, he noted, has been entered into the electricity network. The entire project is expected to be operational in April and will be connected to the Abu Dhabi electricity network. Al Marar said that the department is preparing to launch in the first quarter new projects in the energy sector that will contribute to the sustainability of the energy sector in the emirate, including a new project to generate electricity from solar energy in Abu Dhabi with a capacity of 1,500 MW. “In addition to this, we are preparing to design a project to produce desalinated water using reverse osmosis by the end of Q3,” noted the official.